Tower of Pisa, move over. Visit the tallest leaning tower in the world — the Montreal Tower — located in the Olympic Stadium complex. Take a unique funicular ride up the side of the tower, and from the observatory, admire sweeping views that have garnered the Michelin Guide’s highest rating. Upgrade and enjoy entry to the Botanical Garden near Olympic Park. Explore the beauty of the Garden through its 10 greenhouses and some thirty thematic gardens! 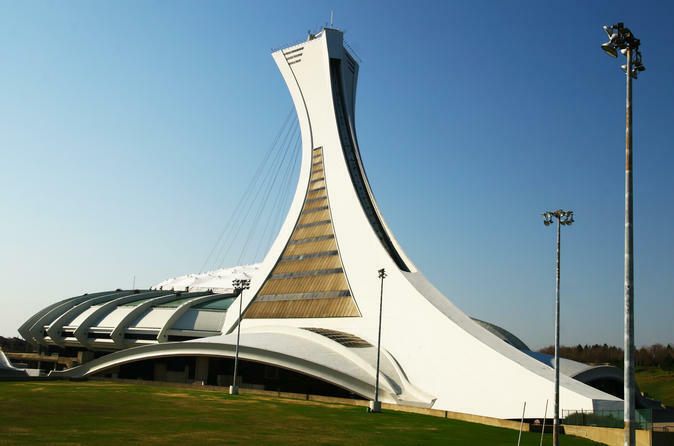 Arrive at Olympic Park, built for the 1976 Summer Olympics, and make your way to the Montreal Tower, part of the stadium complex. Rising 541 feet (165 meters) at a 45-degree angle, the Montreal Tower is the world’s tallest leaning tower, with more than 250,000 visitors each year. Climb aboard a 2-level glass-encased funicular accommodating up to 76 passengers at a time, and enjoy the 2-minute ascent to the observatory deck. The only funicular in the world to operate on a curved structure, the sophisticated hydraulic system maintains the cabin on a horizontal level as it glides up the tower. At the top, marvel at the panoramas of Montreal, the Laurentian mountains and the St Lawrence River Valley. On clear days, see up to 50 miles (80 km) all around — a view that received a three-star rating from the Michelin Guide. It is no surprise that the Montreal Tower is a member of the World Federation of Great Towers, alongside the CN Tower in Toronto, the Empire State Building in New York and the Menara Tower in Kuala Lumpur. Return to the tower’s massive triangular base, which includes a sports center of seven basins for water sports and a sports hall. Upgrade and add a visit to Montréal Botanical Garden, one of the city’s jewels, is recognized as one of the world’s greatest botanical gardens. It offers a colourful program of events, exhibitions and activities all year long. With its collection of 22,000 plant species and cultivars, 10 exhibition greenhouses, Frédéric Back Tree Pavilion, and more than 20 thematic gardens spread out over 75 hectares, it’s also a perfect place to enjoy fresh air and natural beauty.